Introduction. The Midlands Restoration Project is a long-term (multi decade) landscape-scale environmental restoration initiative designed to increase connectivity and biodiversity in the Northern Midlands, an area with a long history of agricultural production. 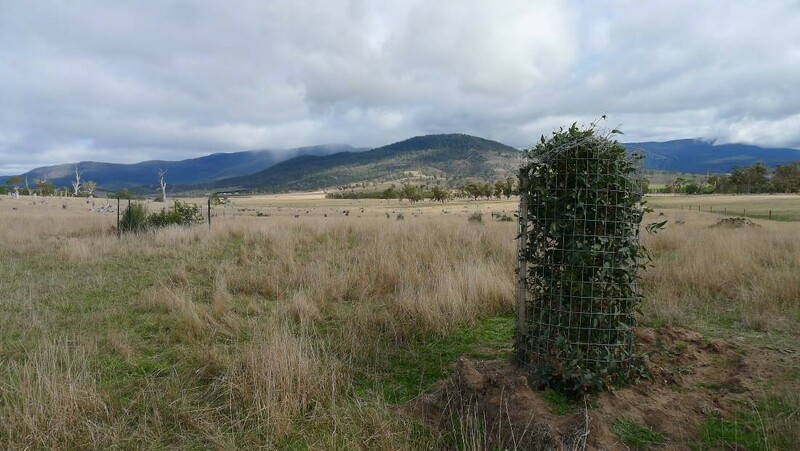 It is intended to provide a demonstration of how strategic native vegetation restoration at an industrial scale can reconnect native animal habitat in a fragmented agricultural landscape. Design of the project complies with the Conservation Action Plan for the biodiversity hotspot and ecological models that identified optimum pathways to reconnect existing vegetation remnants through ‘corridors’ and ‘stepping stones’, to improve habitat and facilitate the movement of native mammals and birds across the landscape from the Eastern Tiers to the Central Highlands and provide better resilience to predicted climate change impacts. The landscape and its ecosystems. The Tasmanian Northern Midlands is recognised as being one of Australia’s 15 “Biodiversity Hotspots” – a place with exceptionally high numbers of native plant and animal species. Although over half of Tasmania’s land area is protected in national parks and reserves, the Northern Midlands biodiversity hotspot is mostly on private land, not formally protected, and its natural values are in a state of decline – with real risks of further species extinctions. The low dry landscapes in the Midlands of Tasmania are predominantly privately owned and have been farmed for more than 200 years. The distinctive dry native vegetation communities are now present as small fragments in a sea of intense agricultural production. Most remnant patches are degraded through loss of understorey, tree decline and invasion by exotic weeds, and are at greater risk of further decline as a result of climate change. A consequence of this is that habitat values for native fauna are compromised, leading to fewer types and numbers of animals present. Aims and objectives. The aim of the project is to reverse the decline in species richness and habitat values in the Tasmanian Midlands biodiversity hotspot. 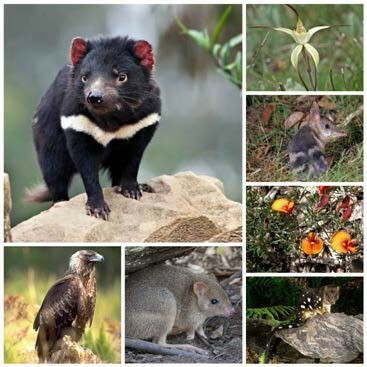 A primary objective is to re-establish functional connectivity for native mammals (quolls, bandicoots, bettongs, Tasmanian devils, bats) and woodland birds in the Northern Midlands, where less than 10% of native vegetation and less than 3% of native lowland grasslands remain. Specifically the project aims to restore 6,000ha in two wildlife corridors across the Northern Midlands. We are doing this by strategic restoration using local native species to buffer and connect existing vegetation through the construction of two wildlife corridors, the Ross Link and Epping Forest Link (see Figs 1 and 2). Works to date. The first 1,000ha in Stage 1 is nearly complete, with 200,000 native plants planted in more than 600ha of grassy woodland and riverflats, and a further 400ha of existing native vegetation being secured for conservation purposes. We are currently planning Stage 2 of the project, to revegetate a further 5,000ha, including 1,000ha of riverine revegetation to complete the two corridors. Woodland restoration: so far we have buffered and restored 410ha of native woodland remnants near Ross and Cressy. The wide-spaced plantings recreate an open grassy woodland suitable for more mobile animals and birds (Fig 3) . Riparian restoration: to date we have replanted 16km of the banks of the Macquarie River, Isis River and Tacky Creek (>200ha) with local native riparian plants. These are dense plantings (625 to 830 stems/ha) that provide habitat for less mobile and secretive animals and birds. Our Macquarie riparian restoration work is recognised as being currently the largest riverine revegetation project in Australia. Fig. 4. Some of the important plant and animal species in the biodiversity hotspot. The new ARC Centre for Forest Value, where students are currently being selected and the projects are being determined. Through these research projects we have more than 15 PhD candidates and post-doctorate staff assisting us to better design and undertake our on-ground restoration activities. In addition to the UTAS projects we have research trials underway to improve tree and shrub direct seeding and native grass seeding methodologies. Cultural restoration. Whilst we place a high emphasis on ecological restoration in the midlands, we recognise that we must engage with the people in the landscape and their enterprises. In order to effectively communicate and engage with the local and Tasmanian communities and visitors we are working with artists, schools, businesses and Aboriginal people to better interpret the natural environment and involve them in our restoration activities. We recognise the importance of supporting vibrant and profitable agricultural and rural businesses and complementing commercial enterprises in the midlands at the same time as improving the natural values and ecosystem wellbeing across the landscape. Education. Greening Australia employs a teacher on an education project associated with the Midlands Restoration Program. The teacher works with the local Oatlands, Campbell Town and Cressy District schools and several urban schools to engage local and city children and communities in all aspects of the restoration project. The education program aligns with the Australian Curriculum across all subject areas and provides students with a great link between indoor and outdoor learning. Landscape artworks. The University of Tasmanian College of the Arts is currently conducting a pilot landscape arts project to engage local schools and township communities in developing sculptural artworks to be placed in the landscape. The artworks will include functional features that are beneficial for native animals, which may include nesting hollows and/ or bird perches. The project’s principle financial supporters in Stage 1 have been the Australian Government, the Ian Potter Foundation, John Roberts Charitable Trust, the ARC Linkage program, Pennicott Wilderness Journeys, Targa Australia, Stornoway, Dahl Trust, and the Foundation for Rural and Regional Renewal. Future directions. In order to complete Stage 2 of the project (to restore a further 5,000ha in wildlife corridors across the midlands) we need to raise AUD$25m. Work is underway on landscape planning, community consultation, landholder engagement and the establishment of a fundraising campaign. 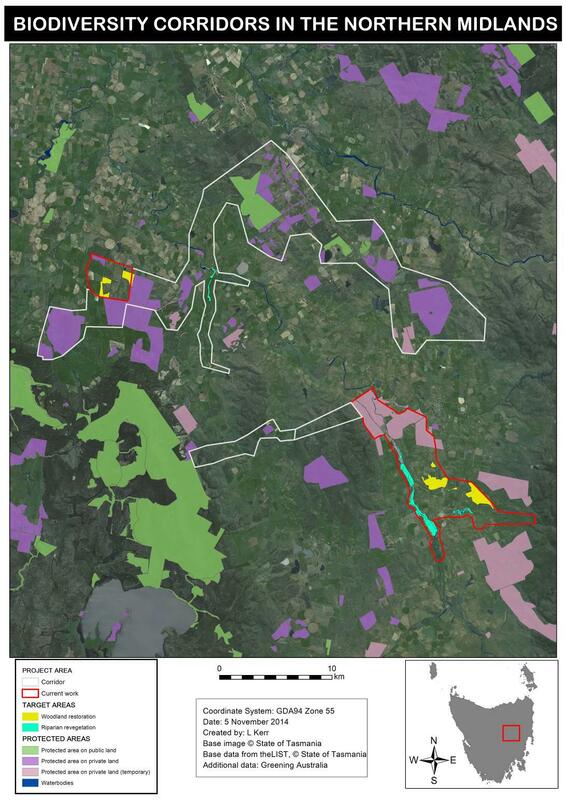 We expect that the Tasmanian midlands will be transformed in the next five years, with two green bands of native vegetation connecting the Western Tiers to the Eastern Tiers and measurable improvements in native fauna habitats and populations. Project partners. Greening Australia is working in partnership with many individuals and organisations to deliver the project and associated scientific research. Delivery partners include midland farmers, the Tasmanian Land Conservancy, Bush Heritage Australia, Australian Conservation Volunteers, Green Army program, Department Primary Industry Parks Water and Environment, UTAS, NRM North, CSIRO, Tasmanian Farmers and Graziers Association, Northern Midlands Council, Department of Education and Independent Schools. Recovery of indigenous plants and animals in revegetated areas at ‘The Waterways’, Victoria. Sign up here to be notified when new project summaries are published on the site. The owners of this site accept no responsibility for any false or inaccurate information expressed herein. Everyone should satisfy themselves as to the accuracy of any information on this site and to any other sites to which we link. In the event that you find anything on this website to be inaccurate or misleading, or have any complaint about the material, please email emreditor@ecolsoc.org.au. We will investigate on receipt and take such action which we, in our sole discretion, determine as being appropriate. It is a feature of our website that the content is contributed by third parties and while we do have some editorial control, any opinions expressed by the contributors are not necessarily the opinions of the Ecological Society of Australia Inc. or of Blackwell Publishing Asia Pty Ltd. So far as lawfully possible, we exclude all liability to you in contract (other than negligence by us which gives rise to personal injury or death). We also exclude liability for any consequential or indirect loss, which may be caused to you by us.